Semra whom I spoke about last week taught me a new way to cook ‘Karniyarik’ which I have called Baked Aubergine with Meat to differentiate from the original recipe published on this site. This stuffed aubergine dish is different as it uses very little oil and yet certainly does not lose any flavour. I love Claudia’s recipe which is on this website but I felt I had to share this non-fried version as it is definitely a very handy alternative if you want to reduce your calorie intake. 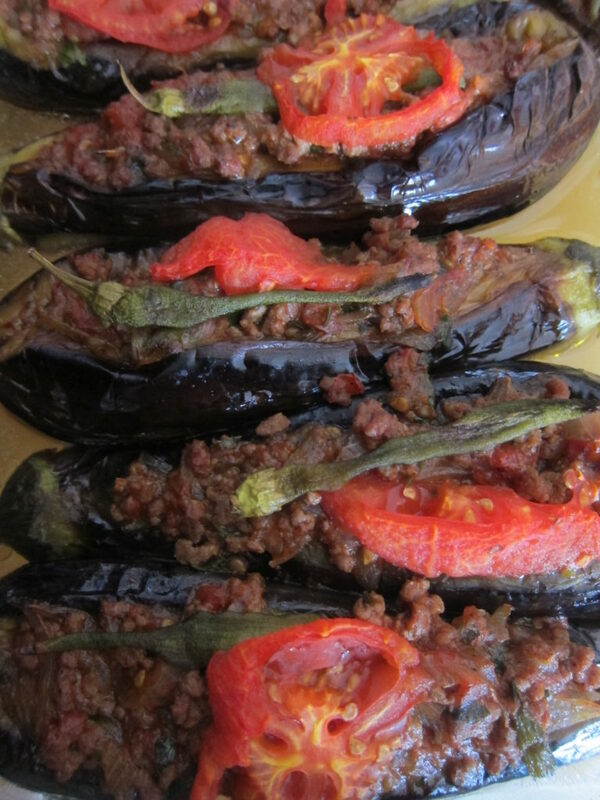 Karniyarik or Stuffed Aubergine with Meat is an extremely famous Turkish dish which was created for a Sultan back in the Ottoman Empire days. It is still highly revered and finding a very flavoursome yet low-fat, easy-to-prepare version for me was just perfect. 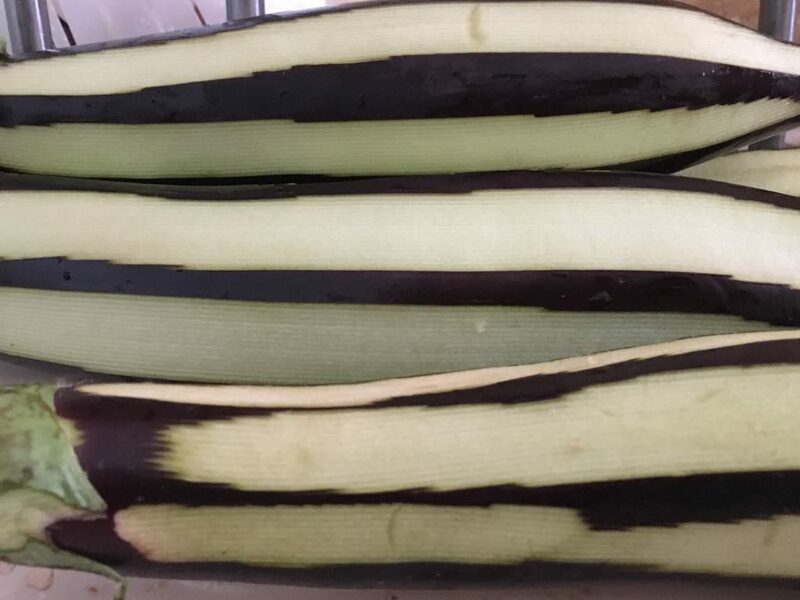 This way of preparing the aubergines prior to stuffing them is not only super simple and completely painless but really rather ingenious and you could apply this method to many such eggplant dishes. So without further ado, I will explain her method. Firstly, for aesthetic purposes only, Semra likes to dress them in pyjamas. That is her description. By this she means to peel them alternately, leaving some skin on. 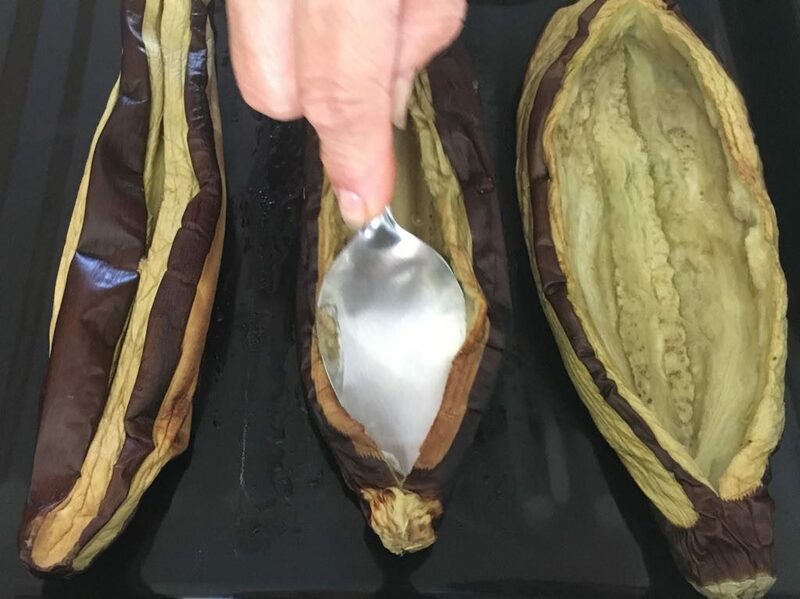 She explained that if you do not peel them at all, the outer skins will remain tougher which is not so enjoyable to eat. Peeling them is necessary, however it is not essential to completely peel them, and pyjamas in her opinion is the most attractive way to present this dish. Aubergines come in many sizes. For this recipe we found that short to medium sized, fairly straight aubergine work best. It is quite a filling meal. 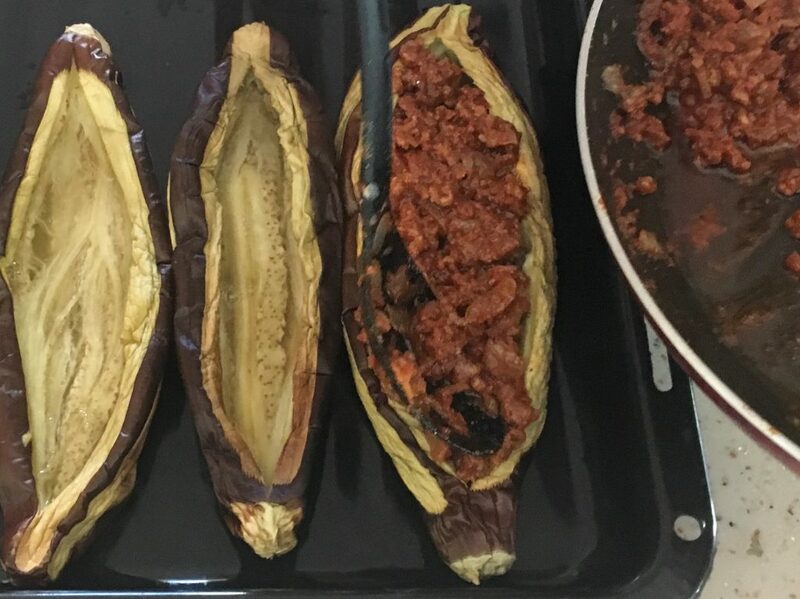 If the aubergine are too fat then the serving will end up rather large by the time they have been stuffed with the meat mixture. Using a peeler to do this is very quick. She also very neatly cut off the stem ends. This was mainly so that it could fit easily into her small baking tray for her mini oven which we had to use today. However, when it came to eating them with the stems already cut off, I found it handy and will continue cutting them off ahead of baking. Once that is done, we placed them on an oven tray and turned the oven on to 170C. As this was a little mini oven, it heats up extremely easily. You might like to preheat your oven first. Bake them for around 15 minutes before turning them. They may need to be turned up to 3 times, doing 4 sides if possible before they seem to have turned pale golden. During this period the meat mixture can be prepared. 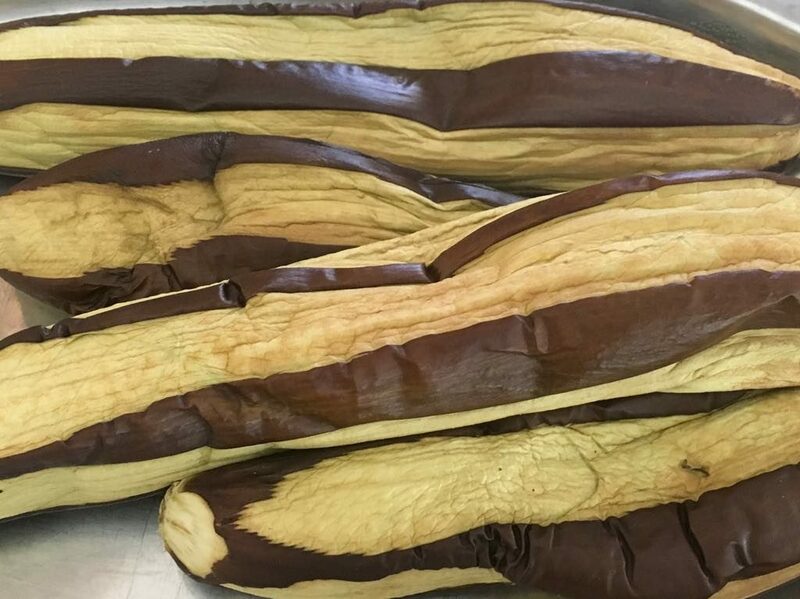 Once the baked aubergines have shrivelled slightly and the skin has turned wrinkly they can be removed from the oven. At this point they should be cooked enough. 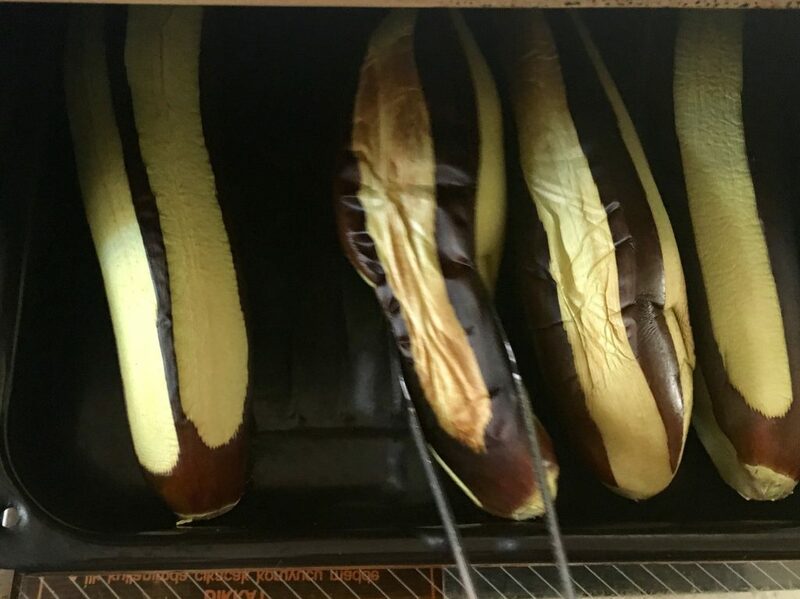 They were left to cool and then Semra split the baked auberines in half lengthways, not going through to the bottom and leaving a centimetre at each end uncut. Then her tool of choice was a Turkish soup spoon, what we would call a dessert spoon or a table spoon would do. With the back of the spoon you gently flatten out the middle of the aubergine creating what looks like a little boat. Perfect for filling up with the mixture we have created whilst the aubergines were in the oven. Now spoon out the meat mixture evenly between the aubergines. And dress with pieces of tomato and green pepper. 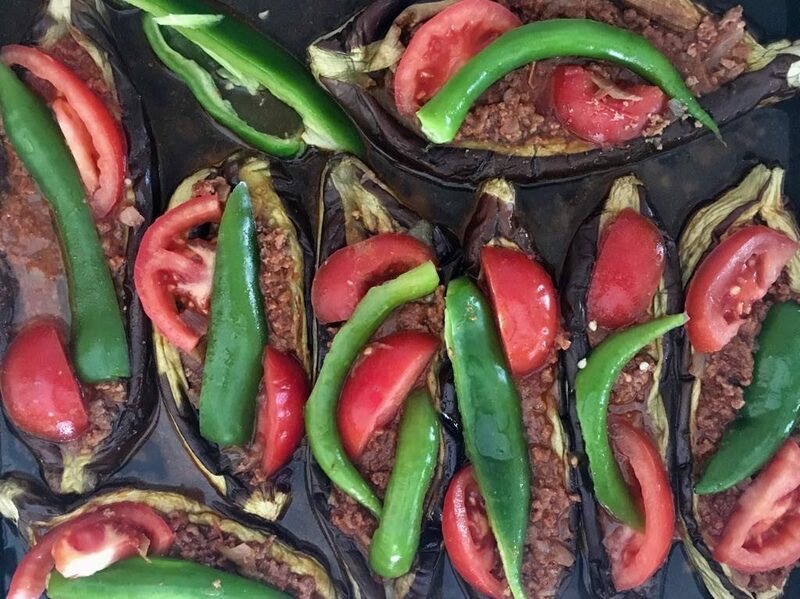 Once all the aubergines are dressed with their meat filling, raw tomatoes and peppers, pour 3/4 of a cup of water around the aubergines and place the baking tray in a preheated oven of 180C for 40 minutes. 35 to 45 minutes later your baked aubergines should look like this. Nice one Lulu, I’ll definitely be trying this method, as you say great for a healthier low fat version. Seems a lot simpler too. Thanks! Thank you Angela. Yes it is a lot simpler. I do hope you enjoy it. Pls let us know!